The National UFO Alert Rating System has been updated for August 2014, with California, Texas, Michigan, Ohio, Florida, Pennsylvania, and Washington moving to a UFO Alert 2 or 3 as the highest reporting states during the month of July 2014, filed with the Mutual UFO Network (MUFON). California was the leading high-reporting state in July with 104 cases, down from 107 June cases, 102 May cases, 80 April cases, 103 March cases, 59 February cases, and 102 January cases – the single state listed as an Alert 2 with 100 or more cases. The other top reporting states had 25 or more cases and are an Alert 3. They are Texas, Michigan, Ohio, Florida, Pennsylvania, New York and Washington. Those states in a UFO Alert 4 category with 13 or more reports include: Missouri, Colorado, New Jersey, Illinois, Kentucky, Georgia, Indiana, Oregon, Arizona, Virginia, South Carolina, Alabama and Tennessee. All other states move to a UFO Alert 5 category with lower numbers of UFO activity. The Watch States – with 10 or more cases – are New Mexico, Wisconsin, Maryland and Nevada. MUFON released July statistics August 1, where the total number of reported UFO sightings is listed by state. The entire country was moved back to the lowest alert level – UFO Alert 5. California takes the lead with 104 cases; Texas, 80; Michigan, 36; Florida, 32; Pennsylvania, 30; New York, 29; and Washington, 26. Those states with 13 or more reports, the next reporting tier level, are a UFO Alert 4 status: Missouri, 24; Colorado, 24; New Jersey, 24; Illinois, 22; Kentucky, 18; Georgia, 17; Indiana, 17; Oregon, 15; Arizona, 14; Virginia, 14; South Carolina, 14; Alabama, 13; and Tennessee, 13. Our Watch States this month are – with 10 reports or more: New Mexico, 12; Wisconsin, 11; Maryland, 10; and Nevada, 10. The sphere remains the most-reported UFO shape with 216 cases; up from 156 June cases; 129 May cases; 150 April cases, 131 March cases, 91 February cases; and 240 January cases. Other shape reports include: Circle, 103; Disc, 95; Star-Like, 81; Triangle, 79; Other, 73; Fireball, 72; Oval, 65; Unknown, 61; Cylinder, 25; N/A, 17; Cigar, 15; Diamond, 14; Flash, 12; Boomerang, 12; Blimp, 10; Cone, 7; Egg, 6; Teardrop, 6; Saturn-like, 3; Bullet-Missile, 3; Chevron, 2; and Cross, 1. The object’s distance from the witness includes: Less than 100 feet, 126 cases; 101 to 500 feet, 133 cases; 501 feet to one mile, 205 cases; over one mile, 1252 cases; unknown, 330; and no value stated, 39. 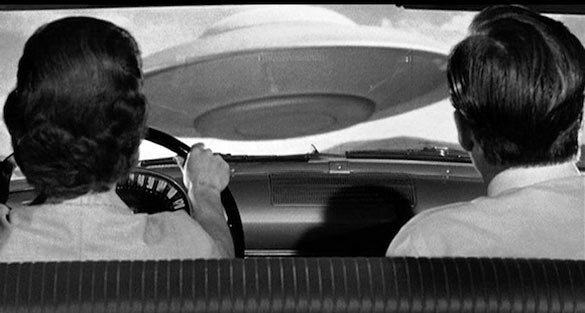 The most interesting UFO reports do not necessarily come from high reporting states – but those states with higher numbers do account for some of the most interesting evidence to study. While UFO sightings seem to pop up randomly around the country, this list is meant to offer a small insight into where Americans are filing reports. Roger Marsh is a UFO writer and content developer. He is Director of Communications for the Mutual UFO Network (MUFON) where he manages media contact, rights and permissions, and content development for television, film, documentary, radio, print and stage. Roger is a MUFON case researcher for History channel’s “Hangar 1: The UFO Files.” He is editor of the monthly international MUFON UFO Journal, executive producer of the weekly “MUFON UFO Traffic Report” radio show; serves as the MUFON webmaster; reporter for the daily “UFO Traffic Report” in web and audio formats; and publisher of the “MUFON Books” imprint. He is the author of Sacred Dialogue, editor of Silent Invasion, and co-editor of Ron Paul Speaks. Roger was featured in the 2015 season premiere episode of Destination America's "Monsters & Mysteries in America." Roger and his wife, Joyce, live in Scottdale, Pennsylvania, restoring a 1910 Pennsylvania four-square. I am curious and pleased about the data observed and collected for the State of California and elsewhere but shall focus my interest on California. For instance, of the 657 sightings of UFOs during the first seven months of the year: why were February and April such low sighting months? How many of the sighting events were reported by the same individual, individuals or group of persons? What was the time of day, range of visibility, and atmospheric weather conditions when the sighting events were observed? What was the approximate time difference between when an event occurred and when an event was reported and who recorded each sighting event: the same individual, individuals or group of persons? Looking at a map of California, where did each sighting event occur and are there clusters of sighting events in any noticeable geographic concentrations such as over the ocean, over water, private property, National Parks, Regional Parks, State Parks, near airports, near military bases, near mountains and at certain elevations? Were any missing persons reported at the approximate time of each sighting? With a total of 657 UFO sightings in a seven month period and an average of 93.86 UFO sightings per month and 3.10 UFO sightings per day something must be going on to capture the attention of the persons witnessing the events. It will be interesting to look at the entire data collection for the last five months of 2014. I’d be quite astonished if populous states such as California and Texas didn’t lead the list for sightings. It would give a better picture of activity, IMHO, to see reports of number of sightings vs. population level.